My accounting of transactions doesn’t exactly align with what my budget says, but I’m calling it close enough. Here is our final budget snapshot. Again, I want to admit that this was not a frugal wedding, not really. There were a few frugal aspects, but for the most part, it was just a small, beautiful wedding. Small = less expensive. But still not cheap. This does account for most of my parents $5000 spending contribution, but not all of their spending (example – BBQ and my make-up). The budget column was the current budget — if something was over or under budget, I just adjusted it to match the spent. This explains why they are identical except where I still plan to spend some money. Rings were included in this budget (I don’t think they always are) and they were not plain ones, so they made up $2000 of the cost. Not many of the snapshots our friends took that hide our faces are very interesting, so we’ll see what the pros come up with. Imagine that, everyone wanted faces in their photos! But if there was one thing I loved that I didn’t expect I’d care about, it was the centerpieces! Look! 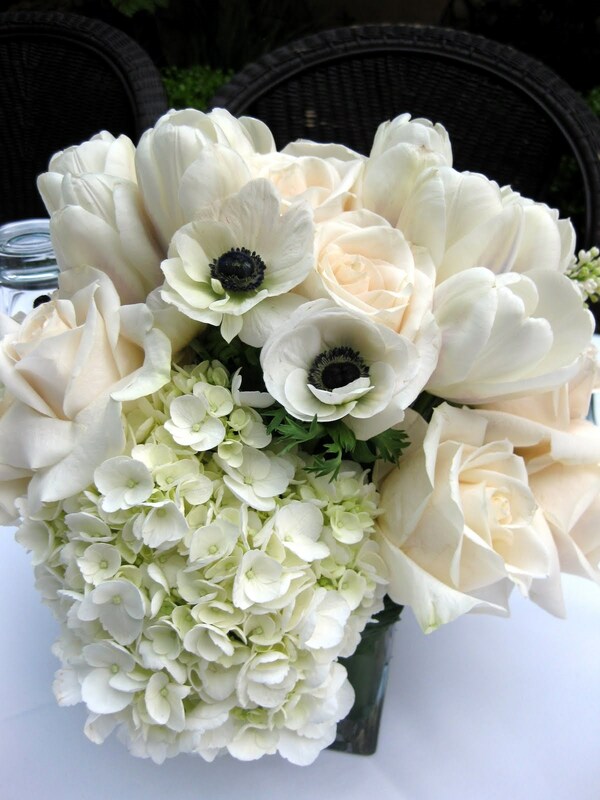 Cream and ivory, square vase, and just… love! Congratulations!! I hope your wedding went wonderfully. Enjoy married life. Looks like you stuck pretty well to a fairly small budget (considering how much people spend these days). Did you save money before hand or have savings that you slowly went through to pay for the wedding? 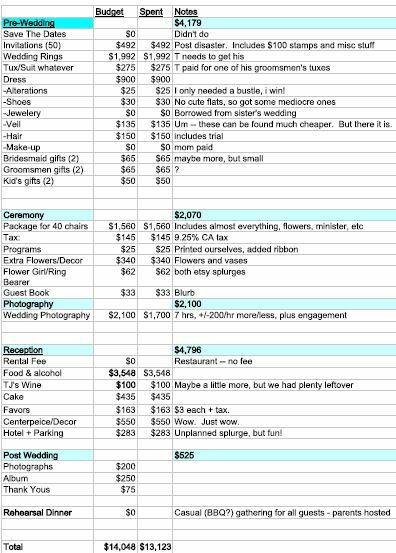 Did you know how much your parents were going to contribute or were you prepared to plan a very small wedding on a more tight budget? Can’t wait to see more pictures – and congratulations! I did save (mostly just while we were engaged) in a designated account, and we slowly went through it until the wedding month, in which the last $3000 was swept out of my accounts.